Pours a cloudy pale copper with orange hues and a rich looking off white almost tan head. Pumpkin spice, some light sweet malts and maybe a little hops on the nose but mostly it’s pumpkin. Sweet then bitter then some cleansing then finishing hop bitterness and more pumpkin on the back end. The pumpkin in this beer has a pretty good taste not artificial at all. This beer has that trademark Smuttynose hoppy finish, not overpowering but this is the hoppiest pumpkin ale I’ve had so far this year. I started this beer too cold. I put it in the freezer to chill it and left it in too long. It is now finally getting to the right temperature for me at 48 degrees. Even the nose has changed; more predominate with spice and hops. This is a very hoppy brew; it’s more like a pumpkin IPA if there were such a beer. It’s not bad and pretty well crafted for an IPA but IPA’s are not by favorite style of beer. The head has diminished to just a thin film but it has kept some very nice lacing on the glass. Now we are at the point where I normally say lets let this warm up and see what it does. It’s now at 67 degrees and has smoothed out a little. It is still a hoppy beer but overall it’s not too bad. Even the final sip was pretty good. Good all around flavors. There could be a little less hops in it for me but it’s not a bad beer. This is not my favorite style but I really can’t find anything wrong with it so I guess it would default to a C maybe a C-. 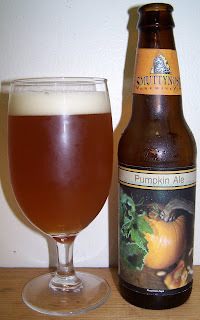 If you like hoppy beers and want to try a pumpkin ale then this is the beer for you.